The U.S. excels at startups, but here's something America isn't starting up these days: banks. Only three new banks have opened in the United States since 2010. Before the financial crisis, over 100 banks set up shop each year, on average, according to data from the Federal Deposit Insurance Corporation, the agency that approves new banks. To be clear, that statistic refers to entirely new banking institutions, but there's also been a sharp slowdown in the number of new branches that existing banks are opening. New banks are supposed to be a sign of a healthy economy -- and robust competition. Historically, they would pop up in communities that wanted more local banking options. Apparently, that's not the case anymore. Some blame financial regulation for the drought. Dodd-Frank regulation was enacted in 2010 to prevent another crisis. A key feature of the new rule was that banks hold more cash ("capital") at hand to deal with a crisis and to place more restrictions on lending. Both of these make it harder for banks to profit. 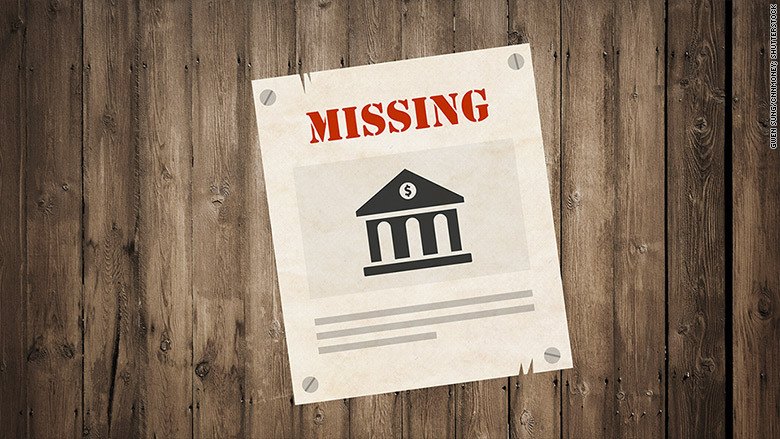 Banking "ain't what it used to be," according to Ernest Patrikis, a partner at law firm White and Case who spent 30 years at the New York Federal Reserve monitoring banks. The law was meant to stop large insolvent banks from infecting the entire global financial system. However, many of the rules filtered down to small banks, too. "Dodd-Frank was like the football players jumping on top of the pile," says Patrikis. But the dearth of new banks actually goes beyond Dodd-Frank. The 2008/2009 financial crisis scared many away, and banking became less profitable because the Federal Reserve kept interest rates extremely low. Startup banks typically take several years to return a profit. With interest rates at near 0%, it's even tougher and would take longer. So no one's willing to pony up the money needed to even start a bank. Investing in a new bank is "a hard sell for investors," says Robert Clark, an analyst who studies banks at SNL Financial. "It didn't look like it would be a safe investment." There's a lot more interest these days in peer-to-peer lending companies, like Lending Club and Prospect Marketplace, which aren't held to the same requirements as traditional banks. Economists at the Federal Reserve estimate that 75% to 80% of the massive drop in new banks is not tied to regulation and this decline would have probably happened anyway as a normal course of business. Existing banks have been looking for ways to cut costs and adapt by closing hundreds of branches and buying up smaller rivals. There's also been a large drop in banks even opening new branches. From 1990 to 2007, banks typically opened around 500 new branches a year. Since 2010, that's fallen to under 300 branches a year. But experts say it's not all bad news. The U.S. still has plenty of banks to serve consumers. "When I started practicing law 45 years ago, there were 14,000 banks in the U.S.," says Patrikis. Now there are about 5,500 banks, according to the FDIC. *Primary Bank (Bedford, NH) has been approved and is set for a grand opening soon.